The Letitia Tyler First Spouse Gold Coin in proof condition, released by the United States Mint on July 2, 2009, is the 10th in a series of 24 carat gold coins designed as a tribute to the past first spouses of the United States. This series of coins are offered as a companion to the Presidential $1 coins that the Mint offers. Letitia Tyler suffered a stroke a few years before her husband John assumed the Presidency. As such, her health prevented her from assuming the ceremonial duties required of a president's wife. This did not stop her from running the household, but she only made one official public appearance, which was at the wedding of her daughter. A second stroke further affected Letitia's health in 1842, and she passed away peacefully on September 10th of that year at the age of 51. Her death would be the first time a president's wife died while he was still in office. Also available is the Letitia Tyler Coin uncirculated version. Additional information on this coin may be found on the Letitia Tyler Gold Coins page of World Mint Coins sister site of FirstSpouseCoins.us. 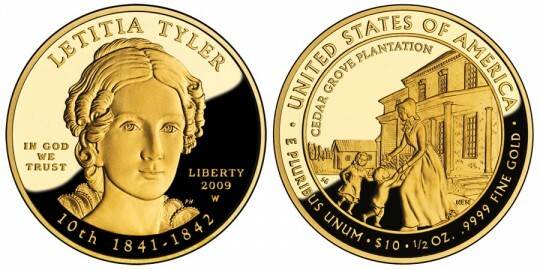 A portrait, designed by Phebe Hemphill, of Letitia Tyler is depicted on the obverse side of the coin. Also inscribed are the words "LETITIA TYLER ", "IN GOD WE TRUST", "LIBERTY", "2009", "10th 1841-1842", and the mintmark "W". Designed by Susan Gamble and sculpted by Norman E. Nemeth. the reverse portrays Letitia and her two oldest children behind their Cedar Grove plantation. Included as well are the words "UNITED STATES OF AMERICA", "E PLURIBUS UNUM", "$10", "1/2 OZ. ", and ".9999 PURE GOLD".